For the record, the roof is closed here at Safeco Field. There will be live updates on its status as we progress throughout the day. The Mariners had to make a few roster moves to put tonight’s starter – left-hander Mike Montgomery – on the 25-man roster. To make room, reliever Mayckol Guaipe, who was called up on Monday, was optioned back to Class AAA Tacoma. The Mariners also reinstated left-handed reliever Tyler Olson from the disabled list and optioned him to Tacoma as well. “He did an outstanding job for us,” manager Lloyd McClendon said of Guaipe. Don’t know much about Montgomery? Well, you aren’t alone. He will be wearing No. 37 tonight. He was acquired from the Rays in spring training in exchange for right-hander Erasmo Ramirez. Montgomery was being converted by Tampa into a reliever, but the Mariners moved him back to starting. He’s made nine starts with Class AAA Tacoma this season, posting a 4-3 record with a 3.74 ERA. He’s struck out 31 batters in 31 1/3 innings. *** Hisashi Iwakuma will throw a bullpen session on Thursday and then another one on Sunday. He’ll throw one more bullpen on the road trip in Cleveland and then if all goes well, he’ll pitch in a simulated game most likely in Houston. Depending on how the simulated game goes, he could throw one more of those or head out on a rehab assignment. The Mariners aren’t putting a time on his return. But July still seems like the earliest possible return time. 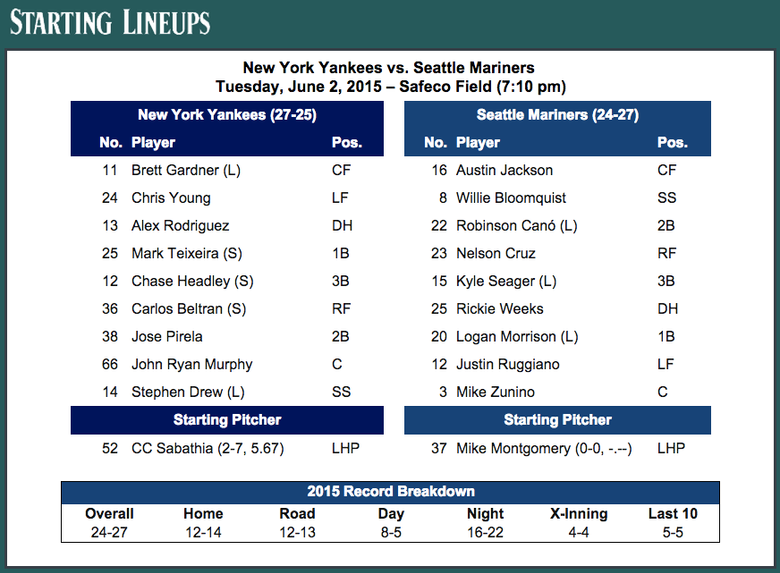 *** Danny Farquhar is making the start tonight for Tacoma. Why? *** Austin Jackson has been thrown out in his last three stolen base attempts. He’s now stolen six bases and thrown out five times on the season. *** Since someone was railing about Mike Zunino’s confidence being shot, here’s McClendon’s response. He basically said the team wouldn’t have him playing if they felt it was detrimental to his development. *** Dominic Leone is the only Mariners’ reliever not available after throwing for two straight games. Here’s my spot with Mitch in the Morning from earlier. We discussed roofs, call ups and other stuf.